It's probably no secret that I love seeing fresh designs made with vintage blocks. 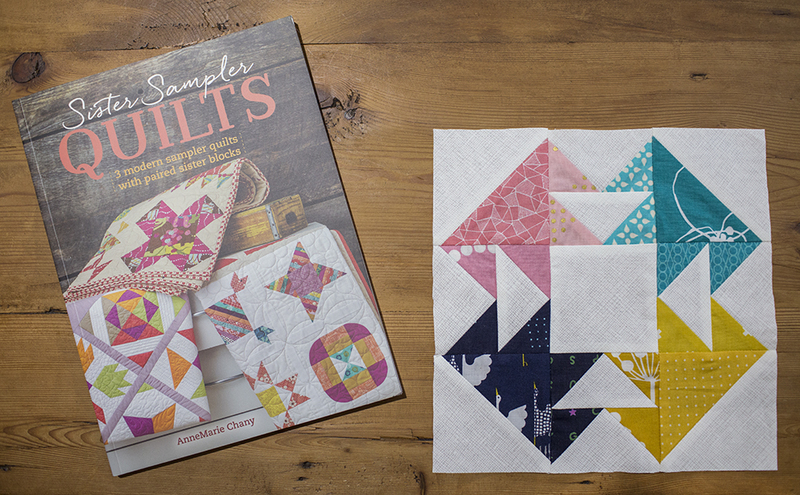 When AnneMarie Chany of Gen X Quilters asked if I would like to check out her new book, Sister Sampler Quilts: 3 Modern Sampler Quilts with Paired Sister Blocks, I was thrilled to say yes! Sister Sampler Quilts is 127 pages filled with 25 blocks, each with 9" and 12" options. The block designs are paired with "sister" versions. In the case of the block I stitched up, Capital T, the sister block was the inverse of the color layout that I made. You can see my block below, and the sister block option in the book photo. In addition to the 25 quilt blocks, AnneMarie provides instruction to make three different modern sampler layouts. The last 20 pages of the book offer tutorials on achieving accurate seam allowances, half-square triangles, quarter-square triangles, flying geese, curves, string blocks and binding. If you love a good block reference book and are looking for creative layouts for your samplers, be sure to check this book out!